One transmitter providing two of the most important compressed air measurements means reduced installation costs and a much easier setup – with only one instrument needing connection and wiring. Dew point measurement combined with process pressure measurement offers further unique advantages. When dew point data is coupled with live pressure input, conversions to atmospheric pressure or ppm are available online, leaving no ambiguity in the information. As an example, regulative requirements of medical gas can be fulfilled easily and quickly. The DPT146 combines the knowledge of more than 20 years of sensor technology development. Proven measurements from the DRYCAP® sensor for dew point and the BAROCAP® sensor for pressure are now combined into one easy-to-use transmitter. Well-developed technology brings both proven results and convenience. Spot-checking and verification of dew point is easy thanks to full compatibility with the Vaisala DRYCAP® Hand-Held Dew point Meter DM70. The DM70 can also be used as a local display and data logger for monitoring all measured parameters. Additionally, also temperature measurement is available when the RS485 serial line is in use. The Vaisala DRYCAP® Dewpoint and Temperature Transmitter Series DMT340 is designed for industrial low humidity applications. Typical applications include compressed air drying and metal treatment. The device is very reliable, easy to use and economical to maintain. The Vaisala DRYCAP® Sensor is immune to particulate contamination, water condensation, oil vapor and most chemicals. Since the sensor withstands condensation, its performance is unmatched for low dew point applications that experience water spikes in the process. The sensor recovers rapidly from contact with free water. The stability of the DMT340 is due to the unique auto-calibration function, patented by Vaisala. The auto-calibration makes the transmitter perform a calibration and adjustment by itself while the measured process is running. If the measurement accuracy is not confirmed, corrections are made automatically. The procedure is so quick and corrections are so minor that it will go unnoticed. This ensures low maintenance and high performance. To continue performance at the highest level, the transmitter can be sent to Vaisala for a NIST traceable calibration. Calibration intervals depend on the application; in normal conditions, a NIST traceable calibration in every two years is recommended. The DMT340 can be ordered with a large numerical and graphical display with a multilingual menu. It allows the user to monitor measurement trends and one-year history. The optional data logger with realtime clock makes it possible to generate more than four years of measured history and zoom in on any desired time or time frame. The DMT340 can be connected to a network with an optional (W)LAN interface, which enables a (wireless) Ethernet connection. For serial interface also the USB connection, RS232 and RS485 can be used. Additionally an alarm relay option is available. The transmitter can have up to three analog outputs. Galvanic isolation of supply power and analog outputs are also offered. The recorded measurement data can be viewed on the display ortransferred to a PC with Microsoft Windows® software. The Vaisala DRYCAP® Hand-Held Dew point Meter DM70 measures dew point temperature accurately over a wide measurement range. The probe may be inserted directly into pressurized processes, and it responds rapidly from ambient to process conditions. The sensor withstands condensation and fully recovers from getting wet. Three probe models, all with auto-calibration, are available. The A and B models are both general purpose probes. The C model is specifically developed for SF6 gas. 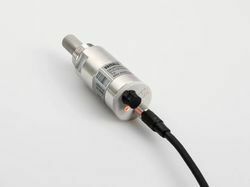 The B and C probe models have an additional Sensor Purge feature that heats and dries the sensor, making the response from ambient to dry conditions exceptionally fast. The DM70 is fitted with the Vaisala DRYCAP® Sensor. 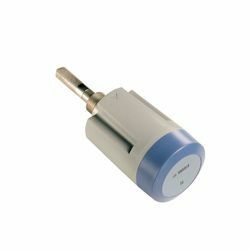 The sensor provides reliable, stable and high-performance dew point measurement. Auto calibration detects on-line possible measurement inaccuracies and automatically corrects dry-end drift in the calibration curve. The DM70 has a versatile and easy-to-use, menu-based user interface, a clear graphical LCD display, and data logging capability. It can also be used as a tool for reading the output of fixed Vaisala dew point transmitters, like the DMT242, DMT132, DMT142, DMT152 and DMT340. The DM70 displays one to three parameters at a time, either numerically or graphically. Several humidity units can be selected. In addition, the DM70 includes conversion from gas pressure dew point to ambient pressure dew point. An analog output is also available. 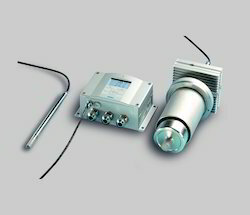 The DM70 meter is suitable for direct process dew point measurement in a wide temperature and pressure range. For more demanding applications, the DM70 can be used with the Vaisala sampling cell adapters, or with the Vaisala DRYCAP® Sampling System DSS70A. DMT242 incorporates the Vaisala DRYCAP® thin film polymer sensor and auto-calibration software. The standard sensor choice for dry gases and desiccant dryers is DRYCAP® 180M and for more humid applications such as refrigeration dryers, a DRYCAP® 180S sensor. Both the sensors are immune to particulate contamination, water condensation, oil vapor and most chemicals. Because the sensor withstands condensation, its performance is unmatched for low dew point applications that experience process water spikes, such as pipeline condensation during a system failure or start-up. The auto-calibration software works on-line while the process is running. If the measurement accuracy is not confirmed, corrections are made automatically. The DMT242 adjusts the measurement, corrects dry-end drifts and continues to function. Calibration occurs quickly, and with corrections so minor, it will go unnoticed. Due to its compact size, DMT242 is quickly and easily installed in tight spaces. Users can perform a field-check by using the Vaisala DRYCAP® Hand-Held Dewpoint Meter DM70. The transmitter can be sent to Vaisala Service for NIST traceable calibration. The recommended calibration interval is every two years. Both transmitters incorporate the Vaisala DRYCAP® sensor, which is accurate, reliable, and stable. The sensor withstands condensation and is immune to particulate contamination, oil vapor and most chemicals. The DRYCAP® sensor stands out for its swift response time and rapid recovery after getting wet. The DMT345 and DMT346 are constructed for direct measurement in hot processes. Therefore, there is no need for sampling systems and trace heating. As a result, high accuracy and constancy are maintained. The accuracy and stability of the DMT345 and the DMT346 are due to the unique auto-calibration function, patented by Vaisala. This autocalibration makes the transmitter perform a calibration and adjustment by itself while the measured process is running. If the measurement accuracy is not confirmed, corrections are made automatically. The procedure is so quick and corrections are so minor that it will go unnoticed. This ensures low maintenance and high performance. In normal conditions, it is recommended to have a traceable calibration performed once a year. The DMT345 is designed for accurate humidity measurement in hot and dry conditions. This model provides unmatched dry end measurement accuracy in temperatures up to 140 °C, however the DMT345 can operate safely in temperatures up to 180 °C. The stainless steel probe is especially designed for high temperatures and has an optional installation flange that allows an adjustable installation depth and therefore a precise positioning. The Vaisala DRYCAP® Dewpoint Transmitter DMT152 is designed for measuring low dew point in OEM applications, even down to -80°C . The excellent long-term stability and reliability of its performance is based on the latest DRYCAP® polymer sensor technology. The DMT152 mechanics have been designed for harsh environments requiring protection against dust, dirt, and splashed water. The DRYCAP® technology has a low maintenance need due to its excellent long-term stability and durability against condensation. The DMT152 is an ideal choice for industrial applications where it is necessary to control very low humidity. Most typical areas of use are air and plastics dryers, dry chambers, pure gases, and highvoltage circuit breakers. The DMT152 measures accurately and reliably also in the challenging combination of low humidity and hot air, which is typical in plastics drying. The Vaisala DRYCAP® Dewpoint Transmitter DMT143 is a miniature dew point measurement instrument. The transmitter can be installed directly into pressurized systems at 50 bar (725 psia) maximum pressure. The long-term high performance is achieved with Vaisala DRYCAP® technology. 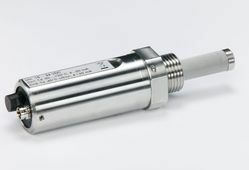 The sensor fully withstands getting wet, and therefore, the transmitter performs exceptionally well in applications that occasionally experience process water spikes, such as pipeline condensation during a system failure or start-up. The sensor is also highly resistant to particulate contamination, oil vapor and most chemicals, and is insensitive to the flow rate. The calibration interval of the DMT143 is two years. 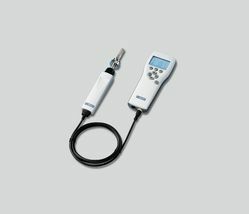 Additionally, the Vaisala DRYCAP® Hand-Held Dewpoint Meter DM70 can be used to confirm the performance of the DMT143 without disconnecting the transmitter. For any adjustment needs, the transmitter can be sent to Vaisala Service. The auto-calibration software works on-line while the process is running. If the measurement accuracy is not confirmed, corrections are made automatically. The DMT143 has a variety of features to choose from, including different output, installation options and alarm LED. Due to its small size and light weight, the DMT143 is quickly and easily installed in tight spaces or in small-size pipelines. The alarm LED indicates too high dew point in the process. The trigger point is preset at the factory. It can be later adjusted with the Vaisala DRYCAP® Hand-Held Dewpoint Meter DM70 or a PC. The Vaisala HUMICAP® Dewpoint Transmitter DMT132 is an affordable dew point measurement instrument designed to verify the functionality of refrigerant dryers. It is especially well suited for OEM dryer manufacturers. Direct outlet air dew point measurement provides accurate information about dryer functionality and is more reliable than the traditional method of measuring refrigerator temperature only. Knowledge of the real dew point ensures high quality compressed air at all times and enables customers to optimize dryer capacity. This helps to prevent investment in redundant dryer capacity and avoid unnecessary maintenance and costly malfunctions. The DMT132 provides optimal performance in the operating range of refrigerant dryers. In the measurement range of -3 … 20 °C (+26.6 … +68 °F), where the refrigerator dryers typically operate, the Td accuracy is ±1°C (±1.8°F). The instrument incorporates the proven Vaisala HUMICAP® sensor, which is resistant to compressor oil and most other chemicals, thereby providing excellent long-term stability. It takes just a few minutes to install the DMT132 directly into a dryer or compressed air line through a G1/2" ISO thread. Vaisala sampling cells can also be used. The loop-powered electronics mean that wiring is easy and power requirements are low. The DMT132 operating voltages can be as low as 10 VDC. Verifying the performance of the DMT132 is easy with the compatible Vaisala hand-held DM70 or HM70 meters. The user can perform possible adjustments with the Vaisala HMK15 Humidity Calibrator. The DSS70A is designed to provide dewpoint sampling flexibility for the DM70 hand-held dew point meter. For processes at atmospheric pressure, a battery powered pump is used to extract a gas sample. For pressurized processes up to 20 bar, the sample is measured at process pressure and then reduced to atmospheric pressure for venting or re-direction, bypassing the pump. In all cases, the sample gas passes through a filter to remove particulate contamination before measurement. Flow through the system is controlled and monitored with a needle valve and flow meter. 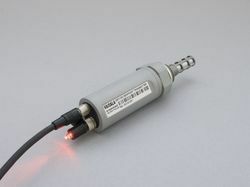 The DSS70A is easily connected to an appropriate sample point with tubing (typically 1/4” or 6 mm). The measured dewpoint must be below ambient temperature to avoid condensation in the system. Gas temperatures higher than +40 °C (+104 °F) should be cooled with a short PTFE (included in the DSS70A system) or stainless steel tube prior to entering the DSS70A. DSS70A is an accessory for DM70 Dewpoint Handheld Meter. The DM70 can easily be connected to pressurized processes. In addition to direct pipeline installation, a variety of sampling cell options are available for gas sampling. The DSC74 sampling cell is the recommended choice. It has a variety of connection adapters that allow several different ways of installation. The quick connector with a leak screw allows a very fast connection for compressed air lines. Additionally, two thread adapters are available for the inlet port. The DSC74B is a two-pressure sampling cell, which enables measurements in both process and ambient pressure. 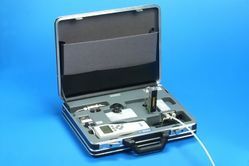 This sampling cell is especially suitable for dewpoint measurements in SF6 gas with the DMP74C probe. The DMT242SC is a basic sampling cell. The DMT242SC2 is a sampling cell supplied with welded Swagelok connectors for sampling in a 1/4” pipeline.